Price: 1200 Microsoft Points ($14.99 US) DOWNLOAD NOW! Microsoft’s “Summer of Arcade” is in full swing, and one of the most anticipated games from the selection this year has been without a doubt the artsy Metroidvania title, Insanely Twisted Shadow Planet. 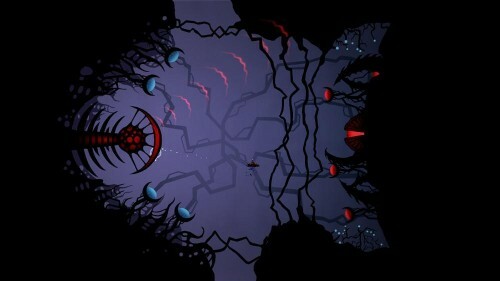 In this title, the player must explore a beautiful landscape as a lone flying saucer, solving mind-bending puzzles and taking down a large variety of enemies along the way. This little alien controlled ship is also beaming with many useful gadgets, which all play a pivotal part in the gameplay. So how well does this little game live up to it’s hype? 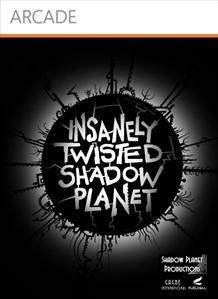 Here is my review for Insanely Twisted Shadow Planet for the Xbox Live Arcade. Insanely Twisted Shadow Planet doesn’t really have too much of a story, but there still is enough substance understand your mission on this journey. The game starts out with a brief cutscene with an alien who watches his home planet become swept in a mass darkness. Unable to just stand around and watch this destruction happen, he quickly boards his small flying saucer and returns to fight this evil before it gets too out of control. Aside from a few brief cutscenes throughout the game, we really don’t get to know much of our brave little protagonist. With that said, I still found the main character’s small backstory to play well with the theme of the game, as the veil of mystery surrounding this little alien is just as mysterious as the stunning world you are to explore. Even though there was no dialogue or a true personality for our little friend in his small flying saucer, I still understood his motives as Insanely Twisted Shadow Planet lets the atmosphere tell the story and succeeds in doing so exceptionally well. Much like Metroid (in which this game borrows a lot from), the sense of being alone is felt throughout the whole experience and the mystery of what lies ahead keeps the player immersed for the entire ride. It’s not exactly an original formula for a plot, but I felt it still complimented the exploration element of the game and made me want to progress further, searching every nook and cranny of each area in the process. 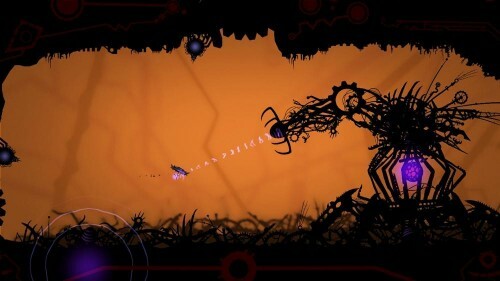 As I mentioned, Insanely Twisted Shadow Planet borrows a lot from Metroid, as the core gameplay style is based on exploration and backtracking. Using the little spaceship provided, the main objective of each stage is to find a path to the next area and simply move on while destroying any enemies that get in the way. Due to how large the map is and the vast amount of twisted paths one could take, it is easy to get lost in all of the madness, but thankfully at the press of a button one can instantly be pointed into the direction they need to go with a full stage view of the entire level at hand. Controlling your ship is quite simple, as players can easily move around with the left analog and utilize any tools or weaponry with a combination of the right stick and the trigger buttons. Starting out, your ship has a lone scan utility that gives hints on how to overcome an obstacle or barrier. As you progress however, you quickly get new several new tools that act as forms offense, defense and interactivity. Players are eventually equipped with the likes a ray gun, missiles, a mechanical claw, and a buzzsaw, just to name a few. While exploration is the main ingredient of the gameplay, this tool set is the most important and is also what sets the game apart from other titles of the same genre. As you would expect, the ray gun can take out several enemies that block your path, but other items in this spaceship’s arsenal have more than one use. The most prominent is the claw, which can be used to pick up rocks, items, or anything else you can grasp with it’s tiny pincher. Sometimes the game will need you to carry an item from point A to point B to unlock a certain corridor or activate a switch of sorts, but the claw can also be used to grasp onto the environment when a strong wind or current is sweeping your small ship away. 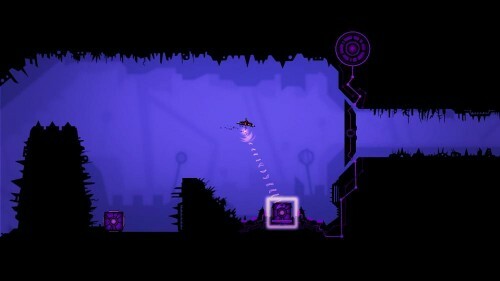 The buzzsaw is a very strong tool that can take out certain enemies or dig a path to a new part of the level. I think that is one things enjoyed most throughout the game, as each time you get a new upgrade, it is both rewarding and exciting to see all of the things your new attachment can do. Of course these tools and attachments wouldn’t be necessary if you couldn’t put them to good use, so thankfully a vast amount of puzzles can be found within each level that allow for just that. The puzzles within ITSP are usually environmental, where you must utilize a tool to overcome an obstacle or open up a new path. For instance, if a few pebbles are blocking the way, you can use the claw to quickly fling the stones to the side or use the buzzsaw to plow right through. Samus would also be jealous of the missile mechanic within this title, as the “missile switches” are usually tucked away in a narrow and twisted path. Since missiles are self-guided, the player must use full concentration to hit the said target with the right stick alone, which offers a refreshing challenge and a fulfilling pay-off everytime. Puzzles are not all about hitting switches and opening new paths though, as certain enemies require much more thought than simply firing a few shots to a weak point to actually defeat. For example, one boss has weak points that are covered with a swarm of insect-like creatures. To overcome this, the player must get an orb, light it with an aura that projects from the walls of the level and lure the insects away. Clever mechanics like this are found throughout the entirety of Insanely Twisted Shadow Planet, which puts more of an emphasis on planning and strategy before the typical running and gunning. Whether you are someone who is keen on exploration or a full blown completionist, the large amount of collectibles, hidden upgrades, and secrets beg for multiple playthroughs and with such a beautiful world to traverse, it shouldn’t be too hard for any gamer to quickly be sucked back in to this shadowy world all over again. 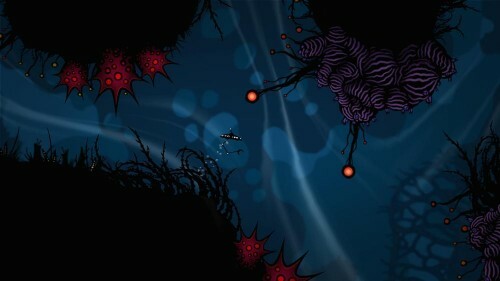 A co-operative multi-player mode by the name of “Lantern Run” also offers a nice change of pace where players must protect lanterns from a large foe for as long as possible. It isn’t too substantial, but this mode does allow for that viewer that may be in awe of the experience to get in on the action right along side the player for some quick fun. Insanely Twisted Shadow Planet features 2D visuals crafted by animator Michel Gagne and his hard work shows with every enemy and new environment you encounter. Each area features a somewhat different theme of sorts which provides a bright and colorful backdrop. When the shadowy figures are moving in the foreground, the combination of the black and pastel color is truly an amazing sight that is like sweet, blissful candy for the eyes. The animation is in my opinion what truly made the visuals pop, as while you are exploring, the well-detailed environment is alive with constant movement. With nearly every aspect of each level being interactive, I spent a good time just taking my claw and literally picking at the stage’s uniquely designed fauna with new animations unfolding before my eyes. Enemies and even your dimly lit spaceship all compliment this art style, adding more depth to the overall atmosphere of the game. While there is some impressive music to be found in cutscenes, the actual game possesses no soundtrack whatsoever. I guess this was done to help give off the feeling of loneliness to the game, but I couldn’t help but think how far a small and graceful track would have gone to add in some emotion to the experience. The ambient sounds of enemies and the world itself make up for this somewhat though. Your ship sounds as a small flying saucer should, and the sounds coming from the environment provide a nice ambient feel that tie well into the strong visuals. 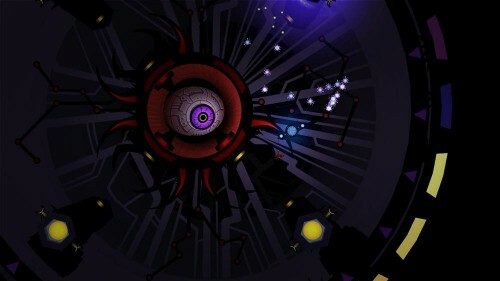 Insanely Twisted Shadow Planet lives up to it’s name in every single way. Players get to explore a rich environment that is simply breathtaking. To add to this, the puzzles found within are all very clever and unique to their own, giving a large variety to the gameplay and letting players conduct different strategies to overcome obstacles. A lot of the ideas may be a bit borrowed, but I honestly want to say that in many cases, this game reinvents those concepts with it’s intuitive design and mechanics. If you plan on picking up any “Summer of Arcade” game this year, mark Insanely Twisted Shadow Planet high on the list as it is one title that goes above and beyond to capture the player’s full attention from beginning to end.